Mandate - The MAI (Montréal, arts interculturels) is a multidisciplinary venue with an intercultural vocation, presenting professional contemporary arts. Its mission is to allow research and reflection on intercultural contemporary art, to encourage exchange and dialogue between foreign cultures and to facilitate, through divers collaborations with different artists and partners, intercultural artistic creation and its presentation to a diverse audience. Thus, the MAI offers varied intercultural programming in performing arts (dance, English and French theatre, music and multidisciplinary arts) and in visual and media arts. The MAI presents established and emerging professional artists from different cultural communities in Montréal, Québec, Canada and sometimes from abroad. To help create a sound and friendly rapport between artists and audiences, programming includes a range of audience development activities. The MAI also targets the emergence, consolidation and autonomy of artistes and organisations working in intercultural practices. The MAI offers creative residencies, as well as mentoring and support services. With the assistance of artistic, cultural and community organisations throughout different boroughs in Montréal, the MAI creates a network with local communities extending beyond the venue’s walls. - Support the professional development of artists from the cultural diversity, and facilitate the integration of their practices. A brief history – Over the past ten years, the MAI (Montréal, arts interculturels) has been run by a not-for-profit corporation, theRegroupement pour le développement des pratiques artistiques interculturelles. An autonomous organisation since April 3, 1997, the Regroupement is issued from the Table de concertation sur le dialogue des cultures, formed in 1990. In 1998, the Regroupement formed the MAI with the support of the City of Montréal. Equipped with a theatre (a modular black box theatre with a capacity of 139 seats), a gallery, a café and two rehearsal studios, the MAI officially opened in May 1999. 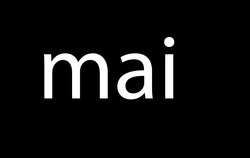 Following a change in status, the Regroupement and the MAI merged in May 2007. As a contemporary arts venue with a mandate specifically geared to the promotion of intercultural art practices, the MAI is unique in Montréal and in Canada. Since its inception, the MAI has offered services to nearly one hundred culturally diverse artists a year and presented an annual program of approximately fifteen intercultural professional productions. The year 2008-09 marks the organisation’s tenth anniversary. Thus far, the MAI has presented over 3,000 dance, theatre, music, multidisciplinary art and visual art shows and exhibits, and welcomed over 80,000 audience members and participants. Audiences from Montréal and the metropolitan area include different cultural communities, university and student communities, as well as youth culture groups. Regular activities involve inviting artists from English Canada and networking with artists, presenters and festivals. Since 2001, programming has become significantly more diverse through the artists, styles (contemporary innovation, world cultures, etc.) and disciplines presented. This is a reflection the MAI’s important contribution to artistic development in Montréal, as world cultures are supported and included in ways to engage a diverse audience. Further, a clear artistic vision encompasses all activities, aiming to promote cultures and the careers of artists working in intercultural arts, as well as the accessibility of this art to audiences (largely issued from cultural communities) less accustomed to visiting the city’s cultural institutions. The MAI is consistently mindful of the quality of encounters between audience and artist. Through unique efforts in audience development with cultural communities, Francophone audiences and the Anglophone minority, the MAI regularly succeeds in reaching these communities, namely by working with their professional artists, socio-cultural groups and leaders. Located in Milton-Park, on the boarder of downtown and Plateau Mont-Royal, the MAI is at the confluence of languages and at the heart of artistic and intercultural activity. Its audience is made up of residents of the City of Montreal and the metropolitan area, including its various youth culture movements. The MAI brings together artists and audiences from different aritistic disciplines to exchange in a casual atmosphere. Dance Studio (room 223) and Theatre studio (room 428) also used for conferences, workshops etc.